On October 31, 1952, four Hollywood actors dressed in fine suits and a beautiful dress stood on a bare stage with only four microphones stands and stools. The actors had scripts and only rose to read their parts. The reading seemed simple and unembellished, but the actors’ voices made it feel like they were in Hell, observing Don Juan and the Devil. On that cool, windy Halloween night, a group known as “The First Drama Quartette” performed Don Juan in Hell by George Bernard Shaw. The cast included four people: Charles Boyer as Don Juan, Vincent Price as the Devil, Sir Cedric Hardwicke as the Statue, and Agnes Moorehead as Donna Anna. The play was directed by Charles Laughton and produced by Paul Gregory. Don Juan in Hell is actually part of a four-act drama called, Man and Superman, written by George Bernard Shaw in 1903. Shaw wrote the play in response to people wanting a Don Juan-themed play. When the play was first performed in 1905, the third act was omitted. The play wasn’t performed entirely until 1915. The third act, Don Juan in Hell, is usually removed because it is a play amongst itself. The act is quite long and is completely different from the rest of Man and Superman since it is a nonrealistic dream episode consisting of Don Juan having a philosophical debate with the Devil. Even though Halloween seemed to be the perfect time to perform this reading, it wasn’t the first time the reading was performed on campus. On March 1, 1951, Don Juan in Hell performed but with one difference. Instead of Vincent Price playing the role of the Devil, it was Charles Laughton. It is unknown why Laughton stepped down from playing the Devil, but he continued to be director of the play. At the 1951 event, 3,500 people came out to the Auditorium to witness the performance. According to the State News, Laughton said the bare stage with only the functional equipment was the best possible setting for this reading. Hardwicke, a long-time friend of George Bernard Shaw said, “I believe he would have liked it this way” in reference to the staging of the play. The programs and wonderful publicity photos of the cast are part of a small collection located in the Archives, the Barbara Van Baalen Papers, UA 17.246. In this collection are dozens of publicity photos, some signed by the performer him or herself. Van Baalen was secretary to Stanley Crowe, Dean of Students at Michigan State College. Crowe was also the Director of the Summer School and Director of the Lecture-Concert Series, which brought national acts to MSC for performances. Because of her association with Crowe, Van Baalen was able to get autographs from many of the performers. Included in this collection are programs related to the Lecture-Concert Series, souvenir programs, campus related documents, and musical related magazines. The photo of Charles Laughton is from the 1954 Wolverine yearbook, when Laughton and Gregory once again visited campus to offer a chance to see a pre-Broadway opening of The Caine Mutiny Court Martial staring Henry Fonda, John Hodiak, and Lloyd Nolan. Looking back, it now almost seems serendipitous for those actors to be performing a play that takes place in Hell on Halloween night. While already famous, the actors played or would later appear in horror films or play a role that is associated with characters of Halloween. Vincent Price appeared in the House of Wax, The Fly, adaptation movies of Edgar Allen Poe stories, Edward Scissorhands, and was the voice over for Michael Jackson’s Thriller. Charles Boyer appeared in the mystery-thriller Gaslight, for which he won the Best Actor Oscar in 1934. Sir Cedric Hardwicke played Judge Jean Frollo in the Hunchback of Notre Dame and starred in the Ghost of Frankenstein as Ludwig von Frankenstein. Agnes Moorehead appeared in the Bat (alongside with Vincent Price), Hush…Hush, Sweet Charlotte, and played Endora, Samantha’s witch mother on Bewitched. Charles Laughton played Quasimodo in the Hunchback of Notre Dame and Dr. Moreau in the Island of Lost Souls. While this blog didn’t tell of a ghost story or of a sinister murder that happened on campus some past Halloween’s ago, it does tell how for one Halloween night, the people that portrayed such witches, misunderstood creatures, and evil souls brought those characters to life on campus! Those who would like to view Barbara Van Baalen papers are welcome to visit the MSU Archives’ Reading Room during our research hours: http://archives.msu.edu/about/contact.php. The inventory for the Van Baalen Papers is available online: http://archives.msu.edu/findaid/ua17-246.html. To hear a recording of Don Juan in Hell performed by Charles Laughton, Charles Boyer, Sir Cedric Hardwicke, and Agnes Moorehead, visit this YouTube channel provided by Orchard Enterprises, https://www.youtube.com/watch?v=ymDBP9LiATo. “’Don Juan’ Crackles with Shaw’s Wit,” The State News, November 3, 1952. East Lansing, Michigan. Laughton, Charles. #1743, People Photograph Collection. Michigan State University Archives and Historical Collections, East Lansing, Michigan. Lecture Concert Series Programs, 1948-1952, Box 1991, Folder 4, Barbara Van Baalen Papers, UA 17.246, Michigan State University Archives and Historical Collections, East Lansing, Michigan. Michigan State College/University Lecture Concert Series Programs, 1949-1957, F.D., Box 1, Norman Penlington Papers, UA 17.85, Michigan State University Archives and Historical Collections, East Lansing, Michigan. Photographs, Box 1919, Folders 96, 99, and 102, Barbara Van Baalen Papers, UA 17.246, Michigan State University Archives and Historical Collections, East Lansing, Michigan. “Quartette Stirs Audience by Voice Quality Alone,” The State News, March 2, 1951. East Lansing, Michigan. Wikipedia. Don Juan in Hell. Man and Superman. Charles Laughton. Agnes Moorehead. Cedric Hardwicke. Charles Boyer. Vincent Price. Paul Gregory. Wolverine Yearbook, 1954. Pg. 178-179. Michigan State University Archives and Historical Collections, East Lansing, Michigan. American Archives Month is celebrated every October to promote the value of archives and archivists. The Michigan State University Archives & Historical Collections (UAHC) is responsible for collecting and preserving the historical records of the nation’s pioneer land-grant university. In essence, the university archives is the memory of MSU. Our collections contain documents, photographs, scrapbooks, diaries, and audio and visual recordings on a variety of topics, including athletics, student life, and Michigan history. UAHC is a valuable resource for the MSU community, historians, publishers and producers, K-12 students, teachers, genealogists, and the general public. UAHC is celebrating American Archives Month with several special events throughout October. We’re kicking off American Archives Month with #AskanArchivist on Twitter. This “day-long event, sponsored by the Society of American Archivists, will give you the opportunity to connect directly with archivists in your community — and around the country — to ask questions, get information, or just satisfy your curiosity.” [Read SAA’s full news release here]. If you have any questions for MSU’s archivists, simply tweet at @MSUArchives with the hashtag #AskAnArchivist. Megan Badgley Malone, collections & outreach archivist, will take you through 160 years of MSU history in 60 minutes at the Mason branch of Capital Area District Libraries on Wednesday, October 5th from 6:30 to 7:30 pm. Learn about the fascinating history of everyone’s favorite land grant university in this presentation featuring beautiful historic photographs from UAHC’s collections. Registration is required. Call 517-676-9088 or register online. On October 12th, MSU Archives is hosting a 1966 Game of the Century 50th Anniversary Celebration. 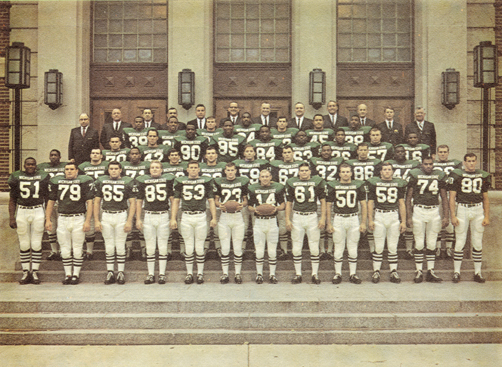 The event will feature a discussion of the game by 1966 MSU Spartan football players, including Jimmy Raye, Clinton Jones, Regis Cavender, Bob Apisa, Jerry West, Sterling Armstrong, and defensive coordinator Hank Bullough, as well as George Goeddeke of Notre Dame (link: bios). Sports radio broadcaster and author Jack Ebling will serve as moderator. Archival materials from our collections, including those related to the game, will be on display in the UAHC Reading Room. Starting at 6:00 pm, Jimmy Raye and Tom Shanahan will be signing copies of Tom’s book Raye of Light. Author David J. Young will also be available to sign copies of his book The Student and His Professor: John Hannah, Ralph Aigler, and the Origin of the Michigan State-Michigan Rivalry. Light refreshments will be provided. The 1966 Game of the Century 50th Anniversary Celebration will be held at Conrad Hall from 6:00 to 9:00 pm. This event is free and open to the public. We are asking people to RSVP so we can monitor the capacity of Conrad Hall. RSVP by calling 517-355-2330 or online 1966gotc.eventbrite.com. This event is hosted by Michigan State University Archives & Historical Collections, with sponsorship provided by the Office for Inclusion & Intercultural Initiatives. UAHC cataloger Susan O’Brien will present an informative session on Genealogical Research in Archives at CADL’s South Lansing branch from 2:00 to 3:00 pm on Saturday, October 15th. Learn techniques for researching your families’ history, and about UAHC’s collections. On Thursday October 20, from 6:15pm to 7:15pm at the CADL Leslie branch, Ed Busch and Ryan Huey will discuss UAHC’s Civil War website and some of the most interesting collection highlights, including diaries, letters, and photographs from the American Civil War period. Have you ever wondered where the Rock came from? How did the idea of having a Sacred Space develop? What’s the story behind the MSU fight song? Take a trip through MSU’s rich history in this session presented by the University Archives & Historical Collections. Hear fascinating facts about MSU history, campus traditions, and things every Spartan should know! 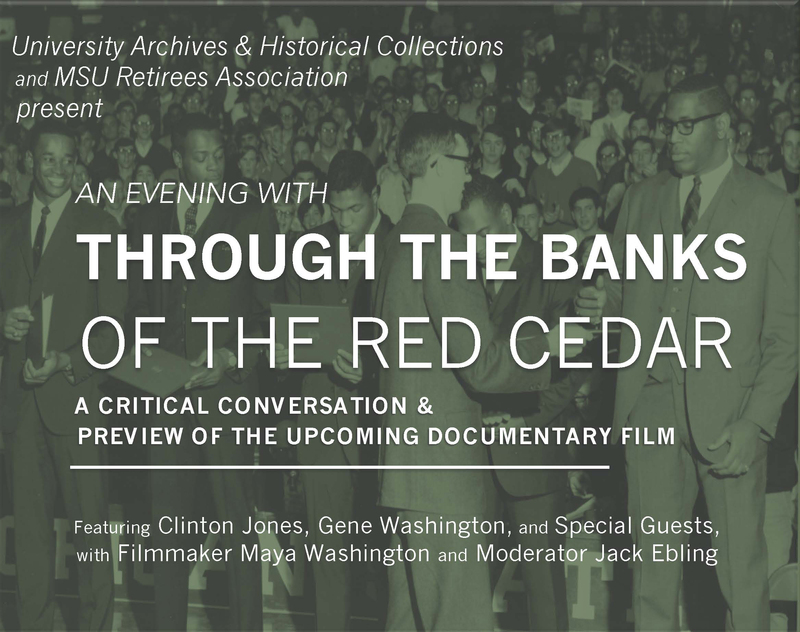 This presentation by archivist Megan Badgley Malone is hosted by MSU Alumni Association, and will be held at the Kellogg Center on Monday, October 24th from 10:00 to 11:30 am. Registration to attend in person is available online. There will be a livestream for those who are not able to attend – http://livestream.com/msualumni. On October 26th, MSU Press is presenting a lecture by Kevin P. Keefe at Conrad Hall to mark the release of his book Twelve Twenty-Five. The book chronicles the Pere Marquette 1225 train, which once resided at MSU and later became the inspiration for The Polar Express children’s book and movie. We will host an open house of the MSU Archives as part of the event. The event runs from 5:00 to 7:00 pm. The author will be available for a book signing prior to the lecture. Copies of the book will be available for purchase. R.S.V.P. online at PM1225.eventbrite.com. To wrap up American Archives Month, Ed Busch and Ryan Huey will have a repeat performance of their Civil War in Michigan presentation at CADL’s Downtown Lansing branch. It will be held on Thursday, October 27th from 7:00 to 8:00 pm. Help us celebrate American Archives Month by joining us for some (or all!) of our fun events throughout October. on Thursday September 10th was a huge success. 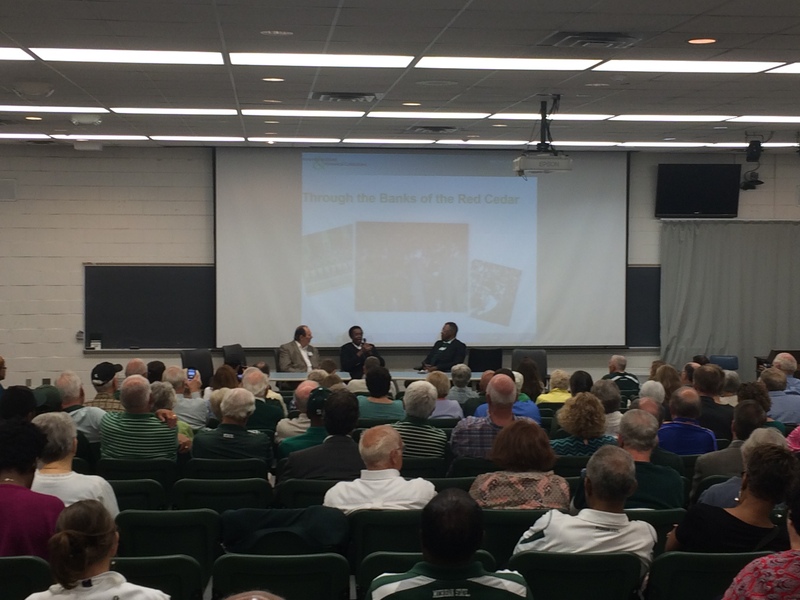 Approximately 250 guests had the opportunity to mingle with Spartan football greats such as Gene Washington and Clinton Jones. The evening started at 6:00 pm with refreshments in the lobby of Conrad Hall and an open house of the MSU Archives. 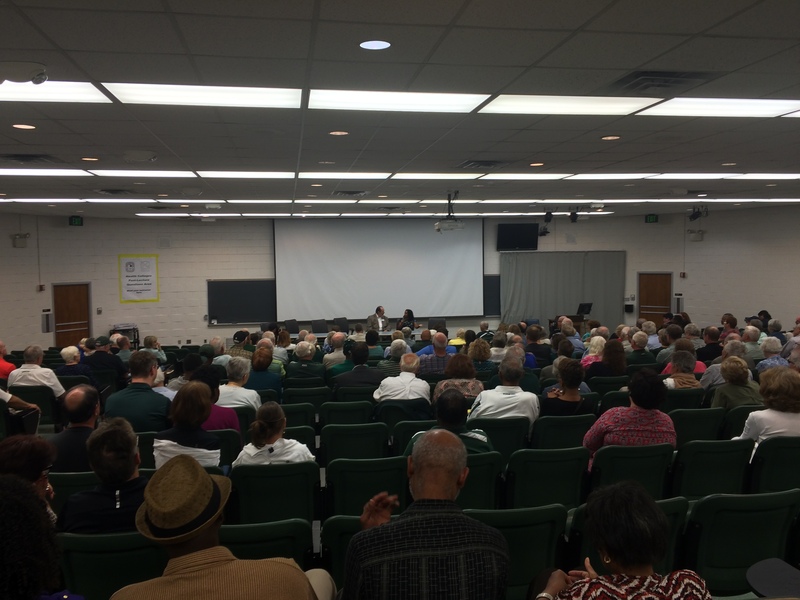 Archivists were on hand to answer questions about MSU’s rich history. MSU athletics collections were featured, such as a football poster from the 1910s, Rose Bowl programs and memorabilia from the 1950s, and photographs and programs from nearly every sport played at MSU. The film “follows the 50 year legacy of the filmmaker’s father, legendary Vikings wide-receiver Gene Washington (College Football Hall of Fame, Big Ten Ford-Kinnick Leadership Award, Michigan State Athletics Hall of Fame, 50 Greatest Vikings Honoree) from the segregated South to MSU alongside highly decorated teammates Bubba Smith (Defensive Lineman), George Webster (Rover Back) and Clinton Jones (Running Back) as they become members of the first fully integrated football team in America, later making history as first round picks in the 1967 Draft” (http://www.throughthebanksoftheredcedar.com/). Maya Washington showed the trailer for the film, which was enthusiastically received by the audience. Ebling was then joined by Gene Washington and Clinton Jones who discussed how they were recruited by MSU football coach Duffy Daugherty in the 1960s and why they believed their team was important. They then asked several other former team members to join them on the panel, including Don Weatherspoon and Sterling Armstrong. For the remainder of the evening they regaled the audience with stories of camaraderie on and off the field. It was a wonderfully entertaining evening. Many thanks to all who made it possible! Video of the program is available on Youtube: https://www.youtube.com/watch?v=CsyjA77H8_Y. We have a very busy fall schedule here at the MSU Archives! 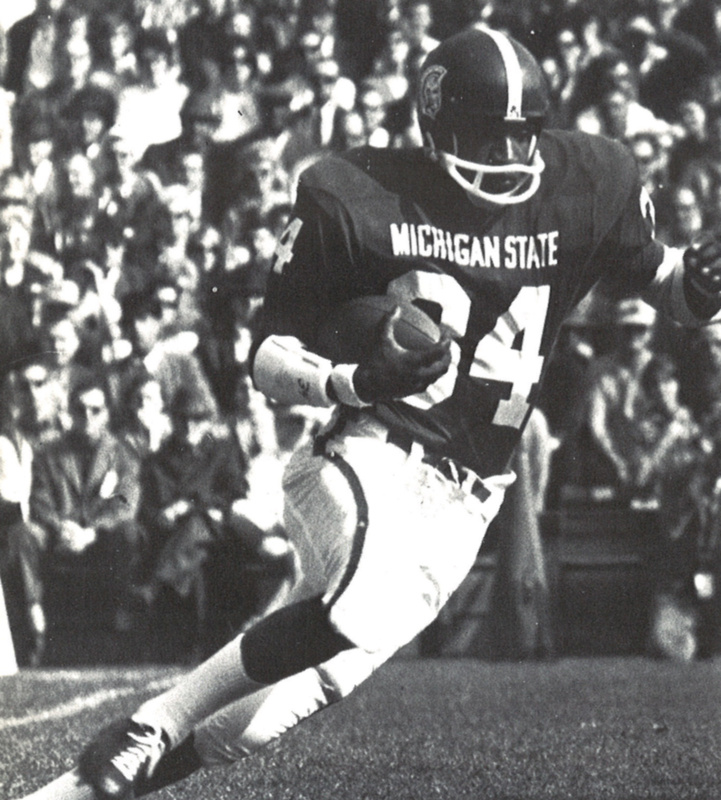 The MSU Archives has two offerings in October through Alumni LENS (formerly Evening College). First is a two-night presentation by Assistant Director Portia Vescio titled “Toil and Trouble at MSU.” On October 16 and 23, Portia will tell stories of rascals and riots, horrific pranks and libelous publications—just a few of the colorful items from MSU’s historical and (sometimes) troubling times. You will be able to view some of the original materials from the University Archives’ collections that document these times. For more information, please visit http://alumni.msu.edu/programs/lens/courseSummary.cfm?activity=76. The second offering is a tour of the MSU Archives hosted by Collections & Outreach Archivist Megan Badgley Malone. The tour includes the Archives’ closed stacks, which are usually off-limits to the public. You will have the opportunity to view archival gems such as the earliest campus maps and photographs, unique student publications, Rose Bowl programs, diaries and letters of MSU presidents and the letter that Charles Darwin wrote to William Beal. You will also see our Historical Collections, materials not directly related to MSU, but of great historical significance. These materials include Civil War diaries and letters, ledgers from the Battle Creek Sanitarium and photos from the REO Motor Car Company. For more information, please visit http://alumni.msu.edu/programs/lens/courseSummary.cfm?activity=69. The correct address for the MSU Archives is: 888 Wilson Rd. Conrad Hall, Room 101. We have several classes coming in this fall for instructional sessions on how to use archives. 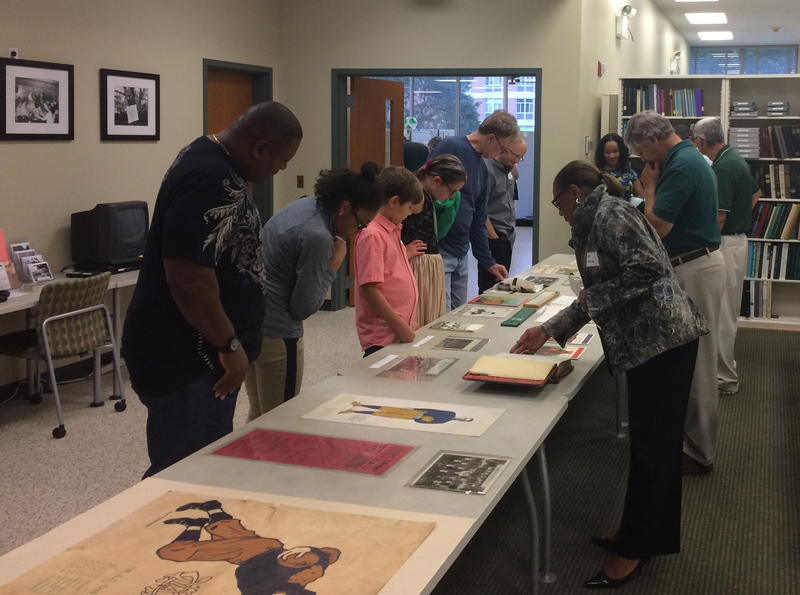 During these sessions, students will have an opportunity to view archival materials from our collections. MSU professors who would like to have their classes come into the MSU Archives are encouraged to contact Megan Malone. These instructional sessions can be tailored to the specific needs of the students. A training session on Records Management and Retention at MSU, provided through Human Resource Development, will be held October 17 from 2:30-4:30 pm. Presented by Assistant Records Archivist Jennie Russell, this session will cover the rules, regulations, and strategies necessary to manage your unit’s records. MSU employees can register through ebs.msu.edu. On October 30 from 2:00-4:00 pm, a Research Data Management CAFE is being held in room 215 of the Computer Center. CAFEs are Communities for Advising, Facilitating and Enabling supported by the Vice Provost for Libraries and IT Services. The Research Data Management CAFE is intended to facilitate cross-campus communication and knowledge sharing about research data management at MSU. The group will discuss topics related to research data management such as, but not limited to, documents for grant proposals, case studies, best practices, scholarly communication issues, application development, technology infrastructure, and services and support for researchers. The CAFE will meet quarterly during fall and spring semesters and it is open to all interested MSU faculty, staff, and students. The intended outcomes of the Research Data Management CAFE are to develop new professional networks and contacts, discover ways to improve campus offerings, and increase awareness of mutual challenges and goals. Finally, October is American Archives Month! American Archives Month is celebrated every October to promote the value of archives and archivists. We will be holding our annual trivia contest which will focus on MSU history. More details will be available at the beginning of October.